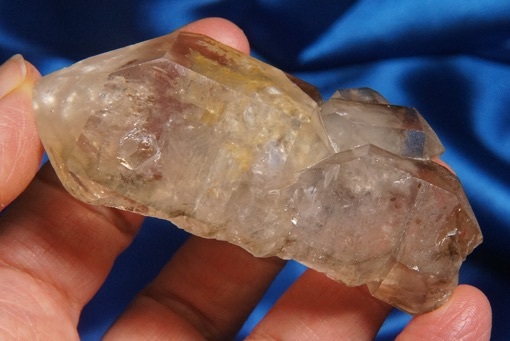 This golden smoky, old stock DT quartz crystal is 2.5 oz and is 2.95" by 1.3" by 0.9" is beautifully chambered and elestial all over. There are students at his base termination that are smokier than the main crystal and with a loupe, you will see two enhydros in his inner chambers. His upper termination faces are slightly iridescent and he has a nice Isis face, all with subtle glyphs. He is totally fascinating and the pictures just plain do not do him justice! He is from Brazil and has a few very tiny dings, but is otherwise quite pristine. When I hold this Spirit, I feel like the mysteries of the ages are just pouring forth in rapid profusion. He teaches how to discover the layers of our own being, evaluating each layer for merit and relevance to our current incarnation. Fenster is German for ‘window’ and truly, this Spirit is a window to the very core of your being. You see probabilities, alternatives and opportunities as each and every experience you had as a Light Being is laid before you. You are able to slide along the time scale, forwards and back, and optimize Soul advancement in this life’s expression. He is a very potent and powerful Spirit and perfect for the Light Worker looking for deeper and more rapid advancement.